UNITED NATIONS, May 30, Updated June 3 -- In Haiti on May 26, UN forces arrested Wilford Ferdinand, known as "Ti Wil." He was flown to Port au Prince on a UN helicopter, then paraded on television by the Haitian National Police, the PNH. On May 30 at UN headquarters in New York, Inner City Press interviewed Edmond Mulet, the head of UN's mission in Haiti, MINUSTAH, before he briefed the Security Council. "The PNH does that," he said. "I don't agree with it, but that's what they do." Later on May 30, Inner City Press asked U.S. Ambassador Alejandro Wolff if the issue of UN-supported police in Haiti televising arrestees had been discussed, by Mr. Mulet or the Council members, in the closed meeting that afternoon. "No," said Ambassador Wolff, "that issue did not come up." Video here. 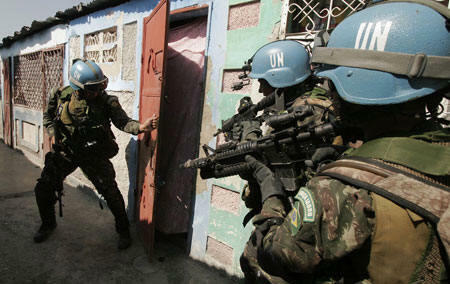 "Until last Friday, when the UN launched a 700-troop-strong operation in the Boston area of Cite Soleil, one of Haiti�s most crime-ridden neighborhoods in Port-au-Prince, the capital, Jamaica Base was the headquarters of the gang chief named Evans, who used it to coordinate his activities in a country that has seen a surge in extortion, kidnappings and the recruitment of children into gangs. Now, doctors and dentists from MINUSTAH�s Brazilian contingent tend to local residents at what is today a new community center." "where no shots were fired and no casualties occurred, as was the case in the final sweep on Wednesday in the Bois Neuf sub-division of Cite Soleil, when the HNP and MINUSTAH took over the headquarters of the Belony gang. No sooner had MINUSTAH and the HNP seized the various gang headquarters than soldiers serving with the Brazilian Battalion transformed them into community centers." UN in Cite Soleil -- opening another community center? Inner City Press asked Mr. Mulet what MINUSTAH does if it inadvertently injures or kills a civilian. "We investigate," Mr. Mulet said, specifying that there are "four or five" such investigations open at present. But he said that MINUSTAH has yet to find itself in the wrong in any case. One case in which MINUSTAH has accused one of its staffers of wrongdoing involves UN engineer Khalid Chughtai. Inner City Press has previously asked the UN Under Secretary General for Management about this case, without response. Mr. Mulet, however, stated that "he is under suspension... he was involved in corruption charges." Others have told Inner City Press that the allegations involve having parked his UN backhoe in the wrong place, such that it appeared to have been put to use for personal gain. "It's more than that," Mr. Mulet said, describing invoices and "receipts falsified." Staffers higher up in the UN are often kept in their jobs and on the payroll during such investigations. Not so Mr. Chughtai. We will attempt to follow this case. Continuing in his naming-of-names, Mr. Mulet said that while he conceded that a journalist killed in Gonaives two months ago was killed because of his role in the media, he thinks the more recent killing of radio reporter was for personal motives which Mr. Mulet described, but which Inner City Press will omit out of respect for the dead. Mr. Mulet acknowledged that at Alix Joseph's funeral, rocks were through at UN vehicles. "The people are misled," Mr. Mulet said. Since in a single nine minute interview, at least two of the UN's own reports about Haiti were disproved, that people "don't have all the facts," as Mr. Mulet put it, should not be surprising. We will continue on this beat.